Carrington Woods is a fantastic place for all ages! Convenient to shopping, in the fantastic Royerton / Delta School system, minutes to Ball State and Ball Hospital, and easy exit to Indianapolis or Fort Wayne. The Cardinal Greenway stretches both ways from the subdivision. 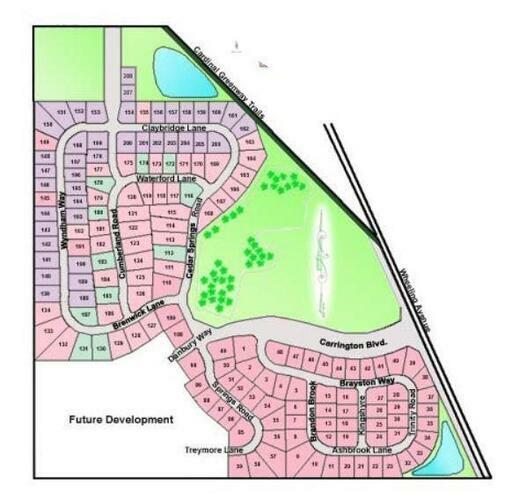 The available lots in the latest phase offer variety of amenities. Sidewalks are in this popular community. All of the lots have been reduced temporarily to jumpstart the building rush. (Five new homes have been started in the past few months.) You can reserve your lot now while you choose your builder and sell your home. Now is a great time to consider building. Save on maintenance and utilities!